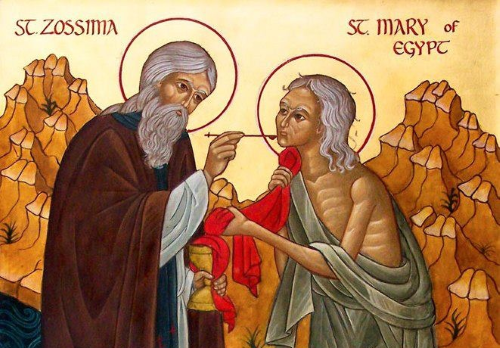 Who was St. Mary of Egypt? On the Saturday before Holy Week, the Orthodox Church commemorates a major feast of the year, the miracle of our Lord and Savior Jesus Christ when he raised Lazarus from the dead after he had lain in the grave four days. Here, at the end of Great Lent and the forty days of fasting and penitence, the Church combines this celebration with that of Palm Sunday. In triumph and joy the Church bears witness to the power of Christ over death and exalts Him as King before entering the most solemn week of the year, one that leads the faithful in remembrance of His suffering and death and concludes with the great and glorious Feast of Pascha. In the early Church catechumens (seekers preparing for baptism) were baptized on Lazarus Saturday so that they could enter Holy Week as Orthodox Christians. On Lazarus Saturday, immediately following the Divine Liturgy, we will baptize four people (one baby, three adults) at St. Peter’s. Parents – Bring Your Children! We will begin with the Liturgy (where Fr. Hans will explain the importance of the day to the children) and baptisms, followed by a pancake breakfast, making palm crosses to be distributed the next day at Palm Sunday and confession for the kids. On the Sundays of Lent we worship with the Liturgy of St. Basil instead of the Liturgy of St. John Chrysostom. What is the difference between the two? 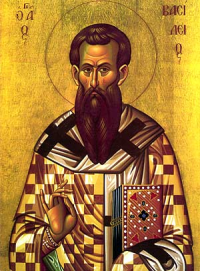 The Liturgy of St Basil is a bit longer because the priests prayers a longer, say 10 minutes or so. 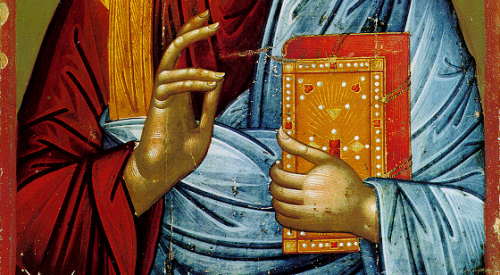 The Liturgy of St. John Chrysotom is derived from the Liturgy of St. Basil. At St. Peter’s we don’t have the resources to provide Holy Week service books to our parishioners. 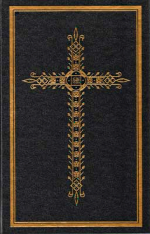 Those who would like a book can order their private copy from Ancient Faith Press or the Antiochian Book Store. Books cost $35 each. Five copies ordered through the Antiochian Bookstore offers a $25 discount. Perhaps some parishioners could order five and donate four to St. Peter’s so that we can start a library for future years. If anyone would care to donate toward service books please see Fr. Hans. Also, the Greek Orthodox Holy Week book (Papadeas) works too because the order of services are the same. The English will vary from the Antiochian book in a few places however. Check out the rich resources about Lent and Holy Week on the Antiochian website. St. Peter’s will hold a Palm Sunday Brunch following the Liturgy on Palm Sunday, April 21. This is a great time of fellowship for all. We need a count so please sign up at Church this Sunday or send an email with names of people attending. On Pascha Sunday we will come together again after the Pascha service to celebrate Agape Vespers on Sunday, April 28, a very short service followed by a community wide Pascha dinner. This will be good! We need a count so please sign up at Church this Sunday or send an email with names of people attending. Baked goods are on sale on April 14. All items pre-ordered will be available for pick up on April 14 as well. Thank you for your support! 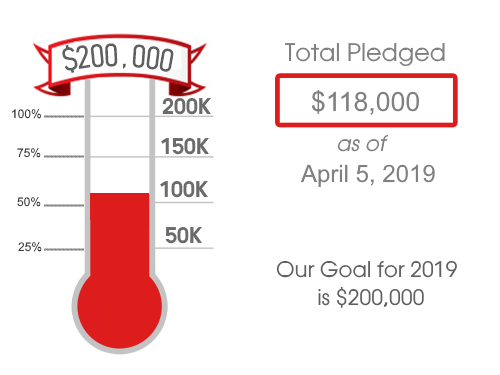 In order to meet our operating Budget goal for 2019 we need to take in $16,666.00 each month. Please pledge in order to meet our goal. Pledge forms are available on the table in the narthex. St. Peter’s is committed to helping the poor among us. If each family could bring some of these items to church this Sunday and the next, then we will get them to Interfaith Charities and the families who need them. Click the image to view and print. Copies will also be available at Church. St. Peter’s has a large selection of Icons available for sale and donation. They come in various sizes — mini, small, medium and large. The Icons are generously donated by Theo Palis and therefore all proceeds go directly to St. Peter’s. If there is a specific icon you are looking for and we don’t have it, Theo might be able to make it for you. St. Demetrios Brotherhood meets on Thursday at 7:00pm. Bible studies cancelled until after Holy Week. 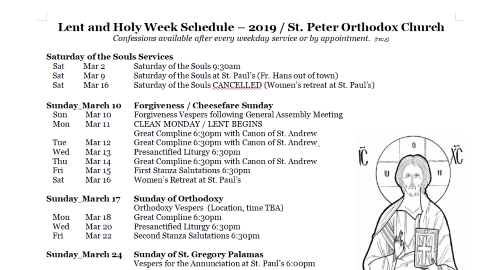 Note: Lent and Holy Week Schedule available on the St. Peter website. Remove yourself in every way possible from all circumstances in which you are inescapably forced to see and hear a lot of bad things. There is company in which bad conversations are a usual or even a favorite way to pass the time. There are amusements in which the tendency to sensual pleasure finds the most plen­tiful nourishment. Those fond of frequenting such set­tings can easily throw their hearts into confusion and become entangled in the web of seduction. Brethren, when Christ appeared as a high priest of the good things that have come, thenthrough the greater and more perfect tent (not made with hands, that is, not of this creation), Heentered once for all into the Holy Place, taking not the blood of goats and calves but His ownblood, thus securing an eternal redemption. For if the sprinkling of defiled persons with the bloodof goats and bulls and with the ashes of a heifer sanctifies for the purification of the flesh, how much more shall the blood of Christ, Who through the eternal Spirit offered Himself withoutblemish to God, purify your conscience from dead works to serve the living God?